These price points are starting rates. We will customize a price that works for your project, whether it will require more or less budget. 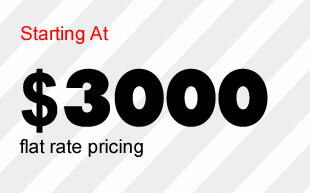 The starting price reflects a standard brochure website with a integrated Content Management System (CMS). We start at a 5 page minimum layout which includes lead capture forms and seo friendly layouts for your content. Custom E-Commerce Solution Have a product you want to sell? We can help! We are experienced with using multiple open source e-commerce platforms, as well as providing custom store solutions if the project requires it.